The public swimming pool might seem like a very ordinary place. What happens when you take a closer look at its objects, architecture, smells, colors, noises and structures? 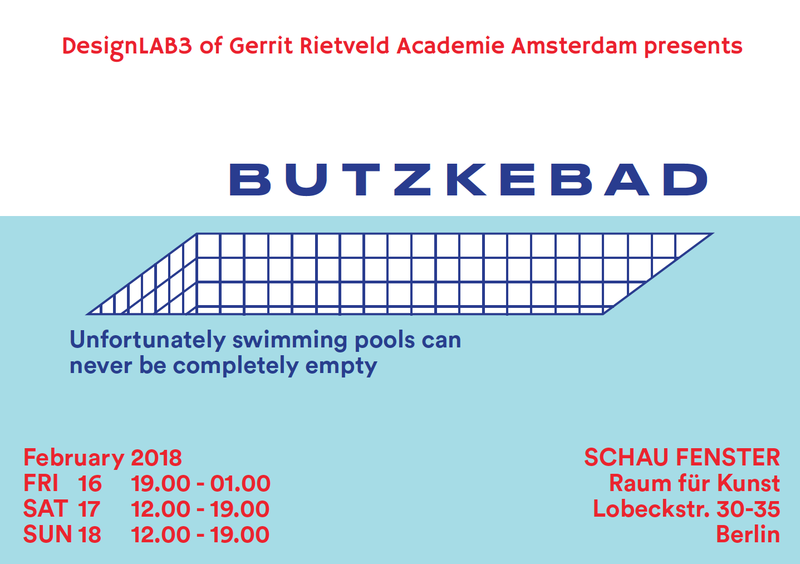 At ButzkeBad we explore the ordinary and stage the ambiguities of a swimming pool as an act of celebration: objects become props, jobs become performances and architecture becomes the scene. – 20:00 Sound Piece by KAPELLA. Alex Köppel is a sound artist and spatial designer based in Amsterdam. – 21:00 Performance by Michela Filzi, multimedia artist based in Berlin. Her performances hold the middle ground between sports, rituals, endurance tests, ceremonies and dancing. – 15:00 Sound Piece by KAPELLA. Alex Köppel is a sound artist and spatial designer based in Amsterdam. – 17:00 Smell Workshop by olfactory artist Klara Ravat. – 20:00 Film installation by Roosje Verschoor graduated as a photographer at the Gerrit Rietveld Academie in 2016. She makes video- and photo installations from her own material as well as found footage. She is fascinated by the hidden stories and structures that determine our identity. – 13:45 Lecture by Clemens Behr on his practice and pools. – 17:00 ‚Men Who Swim“ (2010) movie screening and discussion. POMMES IM POOL – Every day! Hungry? A proper pool serves fries – get our original Butzke-Pommes for the full pool experience.